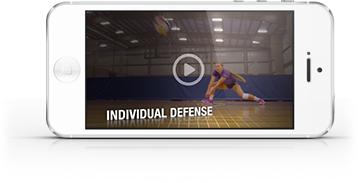 When it comes to preventing injuries commonly associated with volleyball, many athletes, coaches and parents are going about it all wrong. An ACL tears within the first several milliseconds of landing on the ground, yet non-contact injuries don’t happen in one moment, just as alcoholism doesn’t happen with any one specific drink. They are both equally prevalent, but the symptoms of alcoholism are more noticeable to the general public than movement dysfunction. But I believe that everyone can see movement dysfunction once they are told what to look for. The good news is that the majority of non-contact injuries – and even contact injuries – can be prevented. My aim in this article is to go deeper into some of the causes of injury and address common injury areas such as shoulders, ankles, and knees. I will also discuss weightlifting and lifestyle habits, which are factors in both the manifestation and prevention of injury. First, a disclaimer: I’m not a medical professional. These are just my opinions, but they are based on many hours of research and study. To tear down a factory or to revolt against a government or to avoid repair of a motorcycle because it is a system is to attack effects rather than causes; and as long as the attack is upon effects only, no change is possible. The true system, the real system is our present construction of systematic thought itself, rationality itself, and if a factory is torn down but the rationality which produced it is left standing, then that rationality will simply produce another factory. If a revolution destroys a systematic government, but the systematic patterns of thought that produced that government are left intact, then those patterns will repeat themselves in the succeeding government. There’s so much talk about the system. And so little understanding. When relating this to injury, tearing down a factory is the same as an athlete tearing her ACL. Getting surgery is rebuilding the same factory because the mind has not been addressed. The brain has not learned anything regarding improving movement. Most likely, the pain, surgery, and recovery will further deteriorate the quality of movement before it gets better. Then performing current popular physical therapy modalities is keeping the same management team that led the factory into bankruptcy. The “rationality,” or cause, that tore the ACL is still intact. The brain’s ability to control the body has not improved. The cause of nearly all non-contact injuries lies in the brain-body connection. This is why so many who tear their ACL repeat the injury later in life. Therapists, coaches and trainers are obsessed with treating effects rather than causes. Of course they are; effects are easy to spot. This is the equivalent of being on a boat, seeing water in the bottom and bailing it out continuously instead of searching for the hole and patching it. Many coaches, therapists and trainers are doing their best, but their ignorance can be dangerous. Too often I hear people say, “I have weak knees, that’s why they hurt.” This is wrong. Their brain simply does not know how to efficiently organize their movement, and this just happens to result in knee pain. Most likely, nothing is wrong with their knees. Two athletes may move identically and have completely different pain symptoms. One of the most accurate statements about pain is from Dr. Vladimir Janda, a master therapist and expert on pain. He said, “Pain is the only way the musculoskeletal system can protect itself.” Pain is not an obstacle to be overcome but a signal to be listened to. Many times pain can be immediately eliminated with changes in movement and awareness. There can be pain and no physical damage, as well as physical damage and no pain. There can even be pain and damage in completely separate areas. A common example of this is left arm pain during a heart attack. Unfortunately, pain is often the only thing that will cause people to create change. People take better care of their cars than they do their bodies, frequently limping into the service department to get oil changes, rotating tires, and 60,000 mile tune-ups, etc. The parts that make up your body are uniquely designed to you; no surgery will ever leave your body feeling the same as the original factory parts. Cars can run like new when parts are replaced, bodies cannot. One of many issues is that our society does not have enough competent movement practitioners as resources for the public. We should demand that our therapists and trainers learn the skills to keep us injury free rather than just help us recuperate from injury. Furthermore, current norms for lifestyle are not helping our athletes move better and stay injury free. What should be more concerning than the dynamics of volleyball is that student-athletes are sitting in class all day, on top of sitting for excessive homework, on top of sitting and staring down at a phone. When made conscious of these facts, it becomes obvious that this is terrible for the body. What an athlete does in two to three hours of practice is rarely enough to make up for the chronic poor movement choices in life. Part of elite performance and injury prevention is a lifestyle change. Well, I find there to be a few important differences between the two volleyball cultures. One is that very few small children play in Southeast Asia. If they did, it was not often or in an organized setting. The youngest players I saw were in their late teens and nearly full grown. In America, the sport of volleyball is growing rapidly amongst the 14-and-under population. Often, children within this population are too small to fit the demands of the sport. What we end up seeing are terrible compensation patterns, poor mechanics and, ultimately, injuries. The game can only teach the game when the participant can fit the demands of the sport. In youth baseball, soccer and tennis, the sport shrinks to the size of the player. Yet with youth volleyball, courts are too big, nets are too high, and balls are too heavy. I imagine that a small child hitting a volleyball over a 7-foot net is like an adult trying to hit a 3-pound medicine ball over a 12-foot net while defending on one half of a basketball court. I do not see enough programs shrinking the game to suit the participant. Sadly, many people have started to associate volleyball with these types of injuries, just as baseball pitching is now synonymous with shoulder and elbow injuries and soccer is paired with ACL tears. I don’t believe any of these associations have to be true. Nearly all non-contact injuries could be prevented with some level of intervention. Unfortunately, many athletes are led to believe that when they have a weak physical characteristic, it is unchangeable. For a large majority of the population, this is not true. They are victims of poor environments and unproductive self-talk. Statistics say they were probably not born with weak body parts. Rather, the people and environments in their lives have not prepared their body for activity. The cause of an injury at the age of 16 may be the result of the last 10 years of lifestyle deficiencies. Maybe the shoulder they are complaining about is fine and is merely a victim of ignorant coaching. All that being said, I will still go into the details of shoulder, ankle and knee injuries. Since most shoulder injuries happen when hitting, that is where I will direct my focus. Volleyball is far behind many other sports in regards to coaching and understanding basic biomechanical principles. Most shoulder injuries are due to poor movement. The cause of this poor movement could be lifestyle, coaching, environments or other factors. Certain principles of biomechanics must be adhered to for longevity in a sporting career. I have an in-depth arm swing article here (https://www.apiros.team/blog-1/volleyballarmswing) and an instructional video series about the arm swing here (https://vimeo.com/ondemand/apirosvb ). I have found that the two main causes of shoulder injuries are either a poor environment and/or a coach with a poor understanding of the skill of hitting. Athletes may enter the sport without enough time spent with their arms above their head in dynamic activities: hanging, monkey bars, throwing, lifting weights above head, etc. Sandi goes to play volleyball and returns with a sprained ankle. She gets a brace and lets it heal. She returns to volleyball wearing the brace. A few weeks later, she sprains her ankle again. Next, she flies across the country to an “ankle specialist.” She buys a different brace from the ankle wizard. Her ankle heals. She returns to volleyball with her new, fancy brace and sprains her ankle again. Quits volleyball. Let me compare Sandi’s story with another hypothetical one. You’re walking around your house, and your shin hits your coffee table. You go to the doctor, and she prescribes you a bruise cream. A few days later, you kick the coffee table again. You return to the doctor saying the bruise cream isn’t working. Without asking how it arises, she prescribes a different cream and a massage technique. Upon returning home, a week later you kick the coffee table again. The bruise is still there and worse than ever. What are you to do? The answer should be obvious. Stop kicking the coffee table. Maybe there’s nothing wrong with Sandi’s ankles, and the brace is addressing the problem as poorly as the bruise cream. The “coffee table” is how Sandi is jumping and landing. Secondary to that, the people watching her play probably have no idea what safe jumping and landing looks like, so it never gets addressed. Here’s a simple experiment for you to try: using one foot, stand on your toes. Are you more or less likely to lose balance or sprain your ankle? Could you resist being pushed over by someone? Now stand flat-footed. Are you more balanced? More or less likely to roll your ankle? The answer should be obvious. Jumping and landing should be more whole-footed. If you jumped your car, would you want to land on just the front tires or all four? More surface area is better. Land on all four. Land on more of your whole foot. The laws of physics state that all energy is conserved, and this also applies to movement. All movement must be conserved. If an ankle is inhibited from moving due to an ankle brace, that movement will go elsewhere. Where it goes changes from person to person, but, just like every group project in school, eventually someone is overworked and unhappy. When it comes to knees, the cause is still the same. Most likely, the brain has let the body move beyond its capable bandwidth, and pain has commenced. Maybe the athlete’s knees are hyperextending too much. Maybe her legs are straightening out of sequence. Maybe her knees are collapsing inwards. Or maybe her knees hurt because her feet are not fulfilling their role of being an intermediary between the body and the ground. Whatever it is, a brace is only as good as a Band-Aid -- and sometimes worse. Solely strengthening your “knee” via your quadriceps muscle with your trainer or physical therapist probably won’t work. Don’t just assume that knee pain is the result of a weak quad. This is ignorant and irresponsible. Austin Einhorn is passionate about optimizing performance through every avenue possible, including lifestyle design, biomechanics and skill acquisition. He is a certified strength and conditioning specialist who was a 3-time All-American middle blocker at University of California, Santa Cruz. He has worked with pro volleyball players, a variety of Olympians, and athletes from the NFL, NBA, NHL, MLB, PGA, USTA and pro surfing tour. For more educational material and contact information, go to his website at www.apiros.com or Instagram page at www.instagram.com/apiros.team.